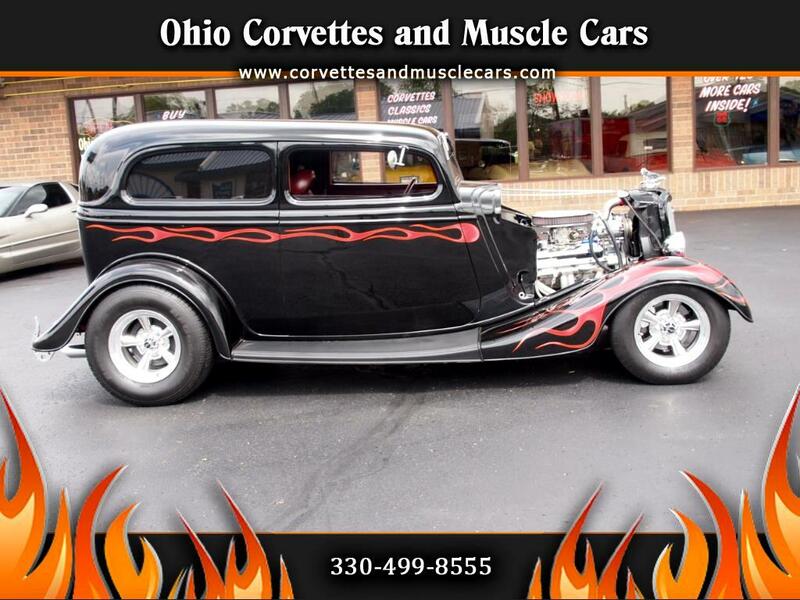 Just added to our inventory is this 1933 Ford Tudor sedan hotrod. It is powered by a small block ZZ4 Chevy crate motor with a roller cam, a 700R4 automatic transmission hitched to a Ford 9" rear end. The engine has only 3000 since installation. This car was professionally built with a Gibbon fiberglass body, TCI chassis, Mustang II front suspension, Ford 9" rear end and includes power windows, remote entry, power heated front seats, Alpine AM/FM stereo with CD, Vintage A/C, power steering, tilt wheel, power brakes...front disc, rear drum, and stainless steel exhaust, Even though we have chosen to display the car with the gorgeous motor visible, there is a hood to this car also. It is in 3 pcs...a top and two side pieces. If you choose to drive with just the top piece, there are 4 custom leather straps to hold it in place. This car runs and drives like a dream. It shifts smoothly and cruises effortlessly at highway speeds. Message: Thought you might be interested in this 1933 Ford Tudor.